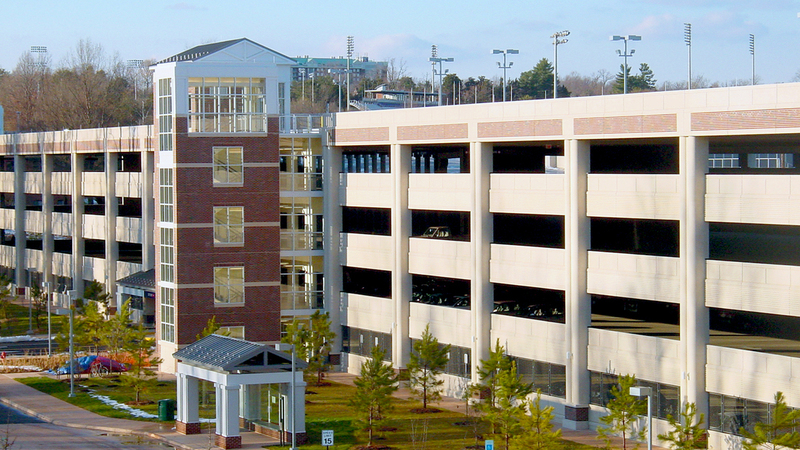 university of virginia emmet street parking garage | Cary Kopczynski & Company, Inc. Calling for high durability and low maintenance, the design criteria was strict and the budget limited for this tough design-build project in Charlottesville, Virginia. CKC responded with a highly efficient and cost-effective precast structural design. Demonstrating their proven ability to design cutting-edge solutions, CKC designers developed an alternative foundation support system utilizing shallow spread footings founded on "geopiers," in lieu of the drilled caissons originally recommended by the geotechnical engineer. This innovative modification saved the University of Virginia approximately $750,000. The Emmet Street Garage also challenged CKC and other team members with environmental issues. These included the need to completely relocate a stream that was originally within the parking structure’s foot print. Through creative design and innovative engineering, the resulting structure was buildable, cost-effective and delivered on time and on budget.